I originally gave the Dwarves larger beards, but Pp pointed out that it's the Dwarves of Khazad Dum and the Lonely Mountain that are called the Longbeards, and that therefore Tumunzahar dwarves might be supposed to have smaller beards. You can see that as usual it was looking promising in pencil and went all a bit pearshaped when I coloured it. I should have avoided giving Caranthir such a clashing palette of colours, and stuck to greens and blues, or at least a slightly more subdued red and paler grey. Also it would probably be a better picture without the mine in the background, and the lighting is a bit dull. Better lighting would make it much more interesting. On the other hand, I do like the dwarves faces and the oldest dwarf's plait. "No great love was there between them; for the Dwarves were secret and quick to resentment, and Caranthir was haughty and scarce concealed his scorn for the unloveliness of the Naugrim, and his people followed their lord. 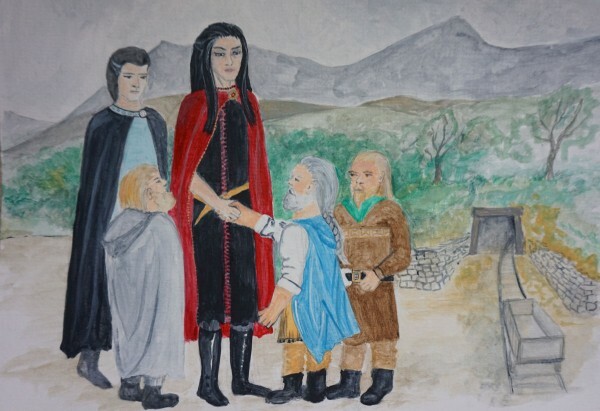 Nevertheless since both peoples feared and hated Morgoth they made alliance, and had of it great profit; for the Naugrim learned many secrets of craft in those days, so that the smiths and masons of Nogrod and Belegost became renowned among their kin, and when the Dwarves began again to journey into Beleriand all the traffic of the dwarf-mines passed first through the hands of Caranthir, and thus great riches came to him. " Maybe I should have made the Dwarves uglier. The mine looks very good in the pencil drawing--I'm not sure why it works less well in the coloured version. I like the dwarves a lot in both versions. I suppose one could say Caranthir looks more haughty in the coloured version, but it seems to come at the cost of his looking a bit less animated altogether. I managed to desquint Caranthir in the end by repainting his eyes. But I agree he still looks a bit flat. I think there's an intrinsic composition issue with a picture where one of the people is roughly twice the height of the others and unlikely to want to kneel to level things out. I like both pictures, especially the dwarves. (Playing Thrandin has given me a new appreciation of dwarves, especially older ones.) But I am now entirely distracted by thinking about non-longbeard dwarves, and wondering if there's something inbuilt that prevents their beards from growing longer than a few inches, or if they have some sort of cultural taboo that causes them to cut them short, or if it's just political necessity, since they don't want to cause a diplomatic incident by appearing to masquerade as a Longbeard from elsewhere. When Pp goes canoeing, he sometimes has difficulty with his beard getting stuck in the zip of his floatation jacket. I throw this in in case it helps with your beard-related deliberations. I'd assumed it was cultural but I guess that the longbeards may be unusually immune to split ends, or perhaps they don't wear things with zips on the front. There is also the matter that a longer beard would be hazardous for metalworking, and prone to doing things like getting scorched and catching sparks (and thus getting holes burnt in it). So if we're talking about dwarves who were particularly well-known for their metalworking, perhaps that is pat of the picture. I especially like the plait and the mine. Caranthir has a very severe expression, particularly in his colored version. I like that, too. I think your head proportions may be slightly off; it seems to me that you do not have quite enough head above the hairline on either of the elves, which I think might add to one's sense of them being a bit otherworldly and haughty. That is, having more head there. In theory, the middle of the eye should sit right at the middle of the height of the head, and yours are a bit above. THe facial proportions seem right, but I don't think the face-to-head proportions are quite right. It's something I never manage to do right. Drives me to distraction. Well, the idea is that we are seeing the elves from slightly below eye level (because the picture is from Dwarf eye level, looking up at the elves). 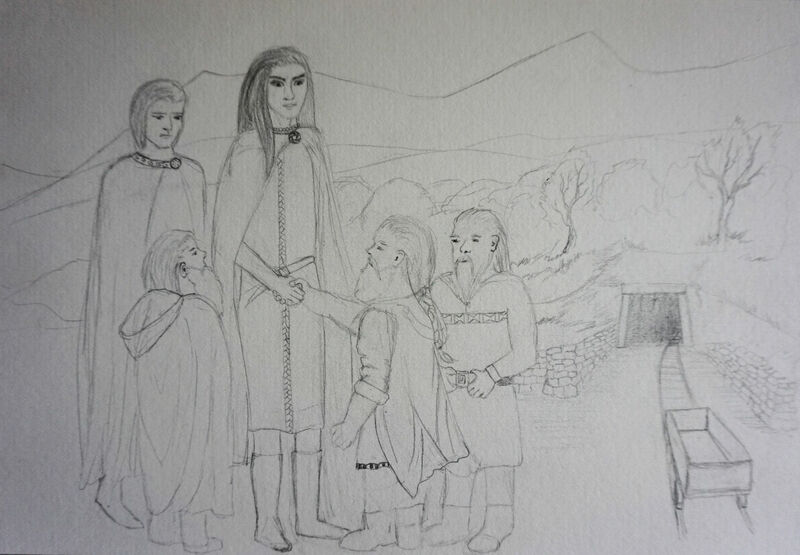 So, the Elves were supposed to be slightly foreshortened (more chin, less forehead). But I think the composition is not ideal anyway because of the height differences, it just looks odd. Maybe I will redraw it in some other way sometime. I think the foreshortening on the elves is a bit too severe. If I look only at your figures, I can kind of catch your intended perspective, but the remainder of the piece doesn't seem to support the same perspective. The strongest offender in that regard is the mine cart; I am looking down into it far too deeply when it should look closer to level. That is, I should see more of its front and much less of its insides. I'm not sure I should see the base of the inside at all. I think that may be the thing that is breaking the perspective you want, because I'd have to be at or above elf height to see it that way. Oh, good spot! Yes, I think you are right about the cart perspective. I was thinking of re-drawing it with the head dwarf standing on a rock, so that he would be at the same height as the elves, addressing his people who stand lower down. That way he could be gesturing as if making a passionate speech and would look more interesting. I'd probably leave the cart out entirely, I think it distracts the eye. I tried covering the cart with my fingers and looking at the image, and that does help a lot with the perspective. The other spot I see a possible problem is the right-hand wall leading up to the mine. It feels to me like the left-hand wall is more or less level perspective, where I'm looking down on the right-hand wall. I think if not for the right wall and the cart, the perspective is suddenly MUCH neater and closer to having a single PoV like you want.